When Judge Raymond Di Luglio raised concern about Ludlow House’s intentions to have a DJ six nights a week, Bernstein explained that they are not DJs “like at Fat Baby,” but are rather “musical programmers” that play background music for events. Bernstein displayed a letter from Bob Zuckerman, executive director of the LES BID, who wholeheartedly supports Ludlow House in hopes that it will bring more daytime foot traffic to the area. He also noted that Ludlow House’s membership fees are only about $60 a month, the same as most NYC gym memberships, and that most of their hours are during the daytime, since they open at 7 a.m. He even accused Community Board 3 of having invalid liquor license standards, because they are more stringent than the SLA’s official law, and balked at a suggestion from the judge that Ludlow House could function without a liquor license. “This liquor might actually do a lot of good for the area,” said Soho House membership director Rachel Smith, during her presentation. She explained that all events have RSVP lists, so they will never be over capacity or cause a line out into the streets. “This remarkable institution would actually change what the opposition hates about the area,” Smith said. LES Dwellers founder Diem Boyd was not impressed. “I’ve partied at Soho Houses before, in the meatpacking district and in LA,” said Boyd. 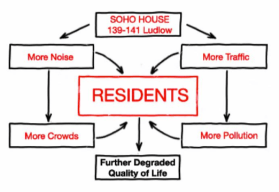 Her main point, aside from the oversaturation of Hell Square, which Judge Di Luglio seemed tired of hearing about, was that Ludlow House was marketing itself as more than a nightclub, when it really wasn’t. “Just because you have a little bit of money and you are at a swanky club, doesn’t mean you act any differently when you are drunk,” said Boyd. Boyd offered letters from councilwoman Margaret Chin and state senator Daniel Squadron in opposition to Ludlow House, as well as Community Board 3’s official resolution against it. The Dwellers have snagged over 175 signatures on their online petition. 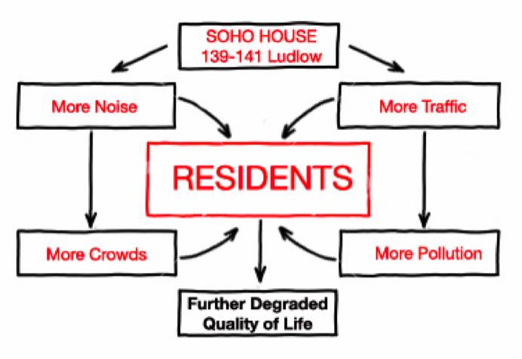 Not all Ludlow Street residents are against Ludlow House, and Bernstein brought along several locals of his own to speak on behalf of the club. Gill Linton, an artist who lives on Ludlow Street, said that community support at meatpacking’s Soho House, where she is a member, helped her start her own business. Carine Montbertrand, an actress, teacher, and 20-year resident of 143 Ludlow Street, which is right next door to Ludlow House, spoke on behalf of 14 others who live in her building. Her bedroom and living room share a wall with the club, and she cited broken promises about soundproofing and showed diagrams that revealed just how close the Ludlow House’s rooftop space would be to the windows of neighboring buildings. Judge Di Luglio will now pass all documents (two very, very large binders) on to the commissioner, and both Ludlow House and the opposition will have a chance for rebuttal. The commissioner will then hold another meeting and make a yes or no decision on the spot, in a process that takes approximately two months in total. Sit tight.